There are so many names for this sauerkraut tool! Whether called a Cabbage Crusher, Sauerkraut Stomper, Sauerkraut Tamper, Sauerkraut Pounder, Kraut Pounder, Sauerkraut Masher, Vegetable Tamper, Vegetable Pounder, Vegetable Packer, Wooden Tamper, Cabbage Tamper, even a Muddler! The device is the same. For the sake of this similarity I will be using these names interchangeably throughout the article. 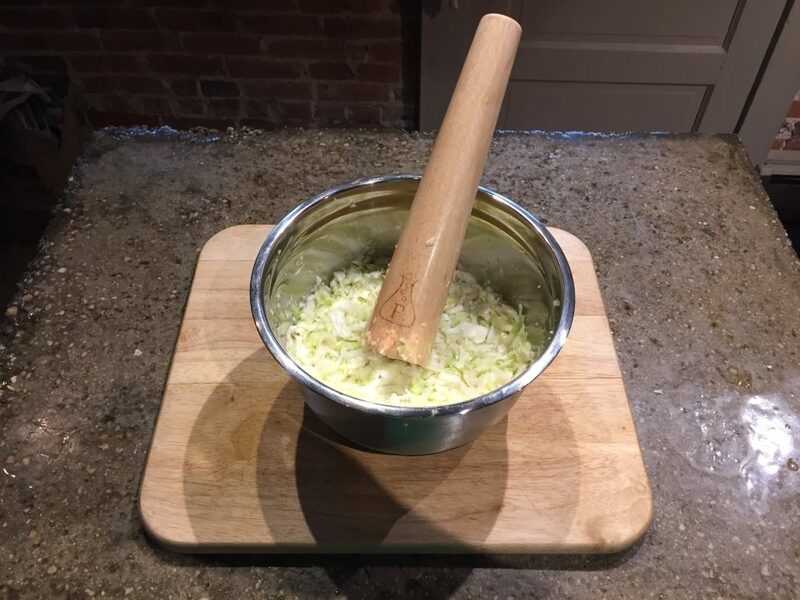 I have received a lot of interest from readers about this sauerkraut tool. For that reason, I am creating a follow-on article to my previous post called Cabbage Crusher Options. 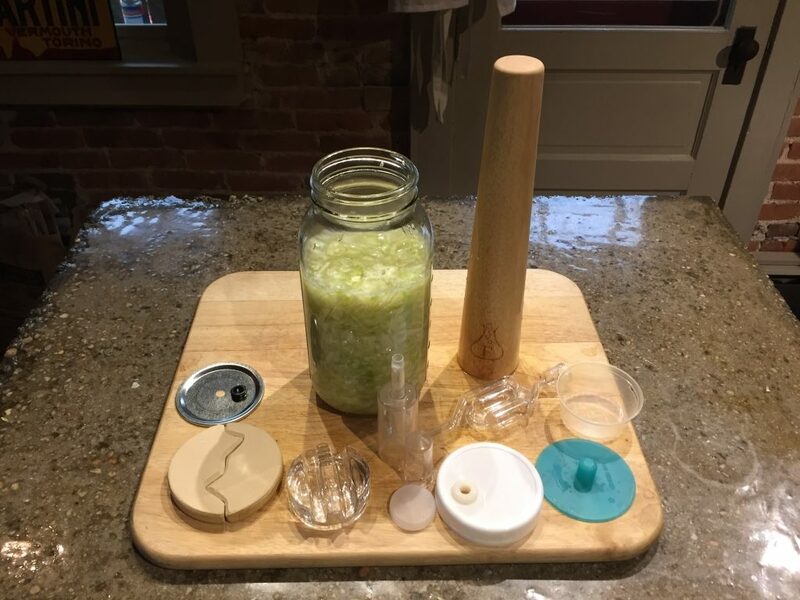 You can also learn How To Make Probiotic Sauerkraut in my comprehensive guide. The first thing you want to understand is the process of probiotic pickling, or simply fermentation. You can read all about probiotic pickling here: Pickles and Probiotic Fermentation. The simple answer to “Why?” is Air. Or rather, oxygen! When fermenting, you want the process to be anaerobic (The absence of oxygen). Pounding your vegetables into a container forces air pockets out. This is definitely the case with cabbage when making sauerkraut. 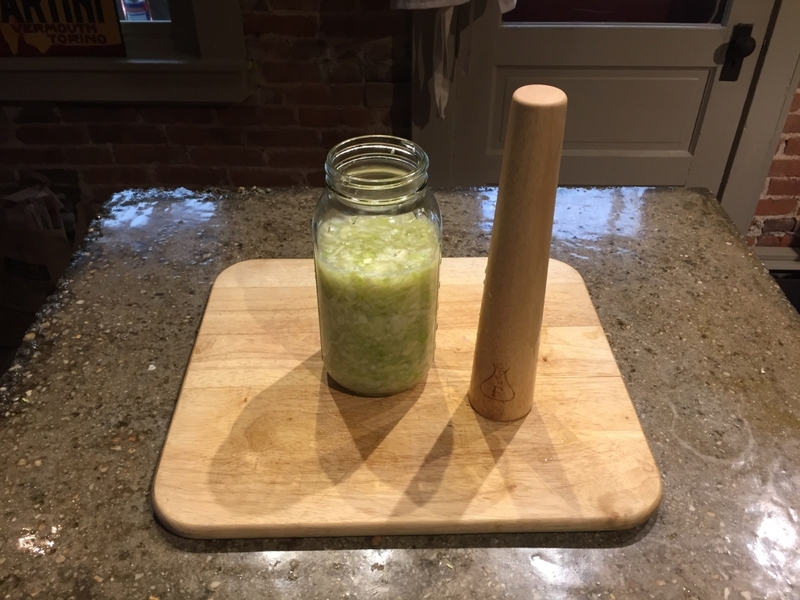 Tamped crushed cabbage prepared in a half gallon mason jar. Another answer is texture. Crushing your cabbage creates a better texture in the finished sauerkraut. Crushing the cabbage also releases liquid and breaks down the fresh cabbage, making it better suited to ferment fully, more uniformly, and more quickly. You can crush by hand but its really a workout. You can crush with other readily available utensils, but a cabbage crusher works best. 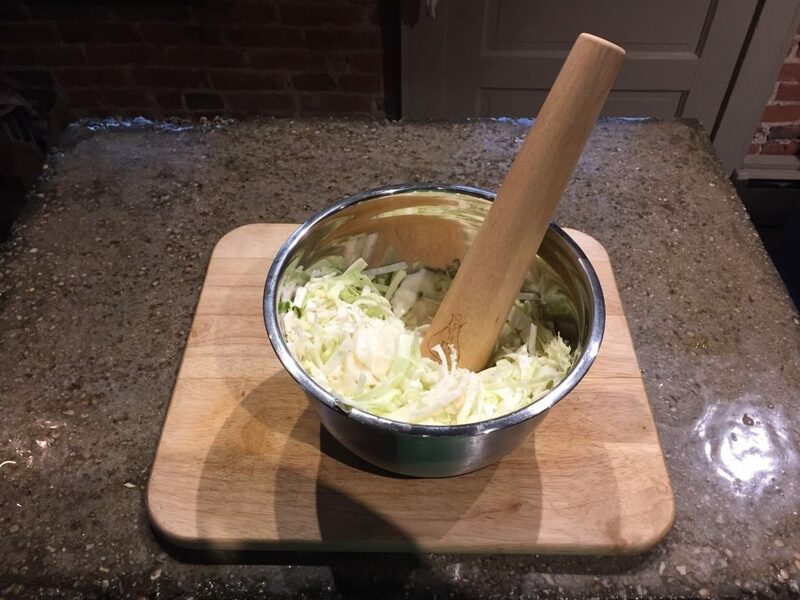 Use a cabbage crusher in a bowl to pound the cabbage, releasing liquid and softening the cabbage. There are a number of materials used to craft a Cabbage Crusher. There are wooden sauerkraut stompers, metal vegetable tampers, and plastic (Please don’t buy plastic!). Wooden sauerkraut stompers are sustainable. Cut down a tree, make a cabbage crusher, plant a tree, let it grow, repeat! Wooden sauerkraut mashers have a pleasant appearance. Wooden cabbage mashers age well. You can pass your beautifully aged cabbage crusher down to your family or friend, along with your recipe, making it an heirloom piece and process. Just buy a wooden sauerkraut pounder please! A wooden sauerkraut pounder with other sauerkraut tools. Tools included are: Fermentology Sauer Stick Fermentation Pounder, Homemade mason jar fermenter lid with rubber gasket, ceramic fermentation weights, glass fermentation weights, plastic fermenter airlocks, a ball jar fermentation lid from picklemeister, a plastic spacer for large mouth mason jar fermenting, and a silicone mason jar fermentation lid from Masontops. What will fit your fermenter? Will the cabbage crusher head fit through the top of your fermenter? 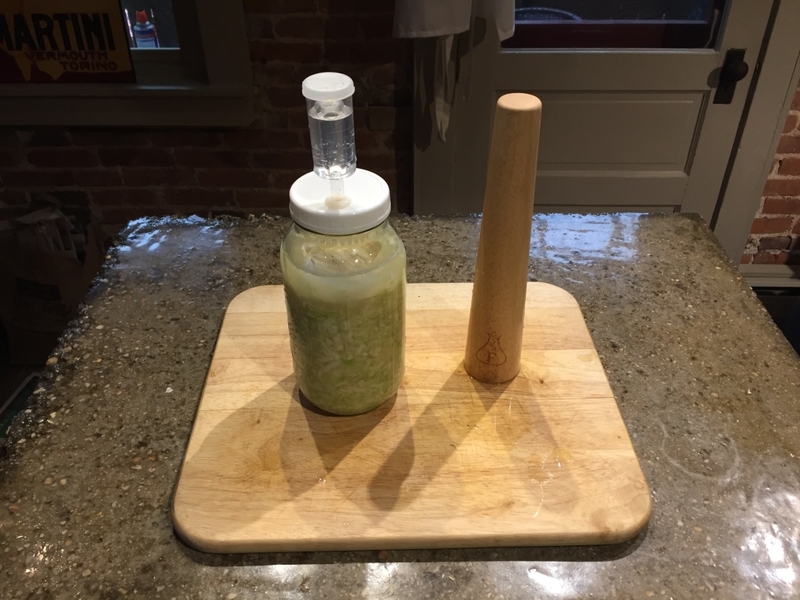 Is the sauerkraut stomper long enough to reach the bottom of your fermenter? 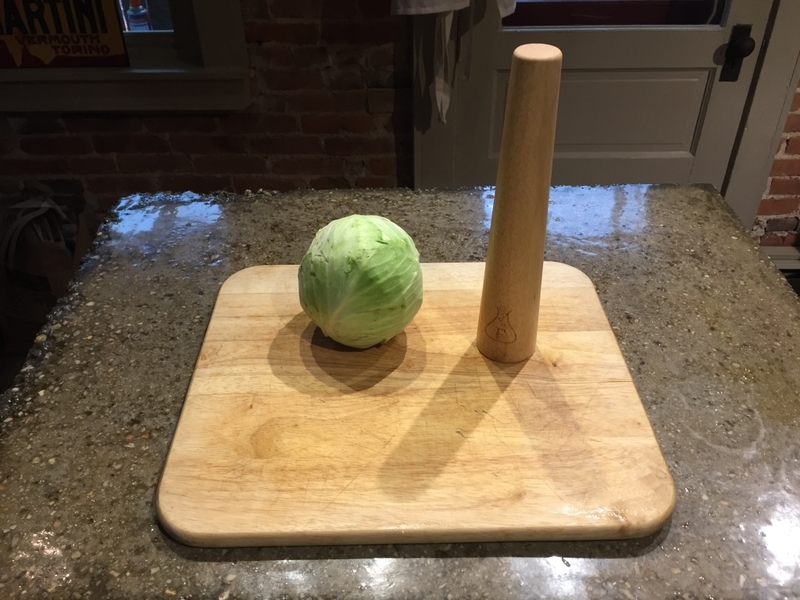 Is the sauerkraut tamper big enough to make the job easy? Weight is a consideration too. Is the cabbage pounder heavy enough to make the job easy? Is the kraut packer light enough that it won’t turn the crushing job into a major workout? If you are producing a large batch in a big fermenter, a small sauerkraut pounder will make the task of crushing and tamping hard. Get a vegetable pounder that is big, but not so big that it won’t fit into your fermenting vessel. Get one that is made of a dense wood so the weight is right, not too light, and not too heavy. There is a wide array of cabbage crusher shapes. Ultimately, a vegetable packer tends to have a handle and a head. The head is typically larger than the handle. This makes sense considering a cabbage stomper is designed to crush, tamp, and pound cabbage firmly into a fermenting container. You want a good amount of surface area on the head to get the job done. However, you won’t want an odd or unwieldy shape which could make it hard to maneuver your cabbage tamper inside your fermenter. For me, simple is better. As I outlined above, my sauerkraut tamper is a tapered baton of sorts. It can even be considered reversible if necessary. The handle is comfortable and the head is large enough to get the job done. Can I say “That’s what she said?” In thinking about it, this article is steeped in innuendo. A sauerkraut tamper needs to fit into your fermenter, tamping the sauerkraut below the liquid. 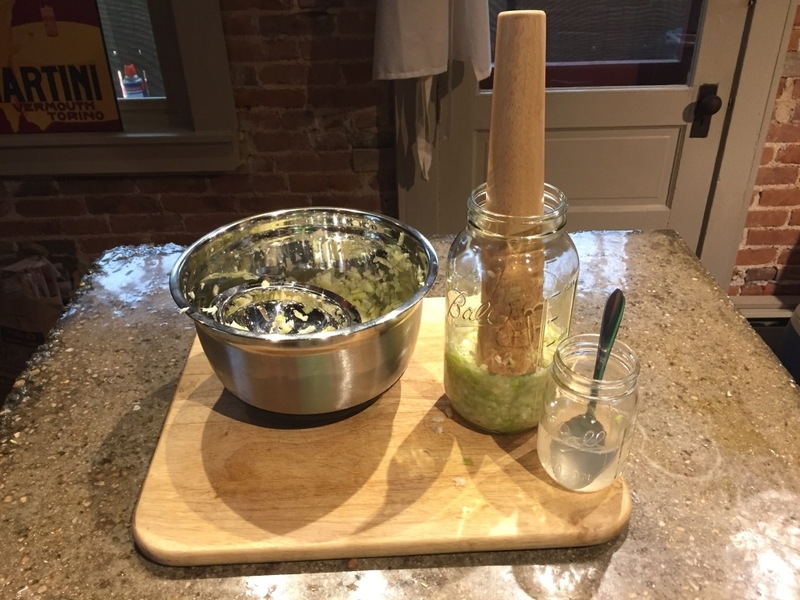 I am sure you have pieced this together already, but there are two common uses for a cabbage crusher. 1. Crushing cabbage: The process of breaking down the cabbage, releasing liquid and softening the fibers and cell structures for better fermenting. This is done in a durable vessel before adding the cabbage to a fermenter. If you have a heavy duty fermenter, stainless steel for instance, you can do double duty in the same container. However, don’t crush your cabbage in a stoneware fermenter for fear of damaging the crock. Crushing is more forceful than tamping. Crushed cabbage in a bowl before adding the cabbage to a fermenter for making sauerkraut. 2. Tamping cabbage: The process of filling your fermenter and getting all the air pockets out of the crushed cabbage. You want tightly packed cabbage for the best ferment. If after you tamp your cabbage you don’t have enough liquid, you can add some salt brine. 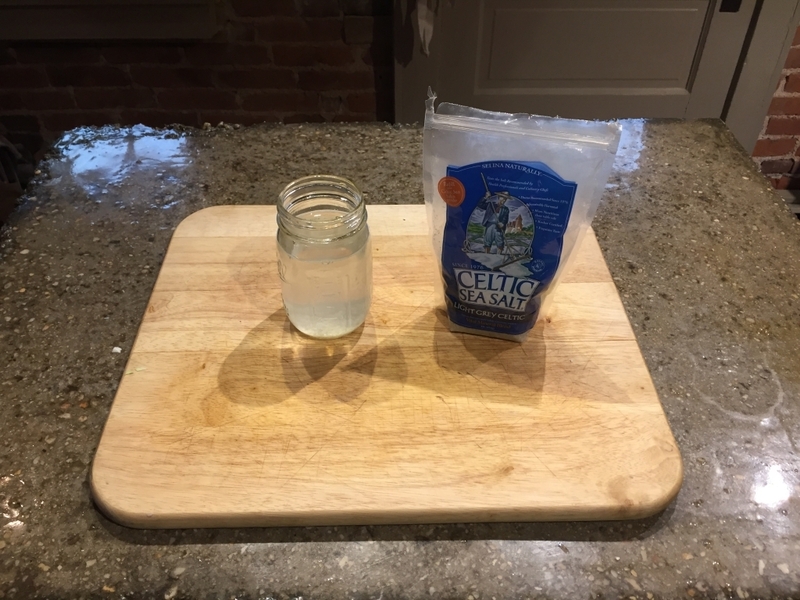 This is salt water made with a teaspoon of salt per cup of water. Tamping cabbage into the fermenter removes air from the crushed cabbage. Making sauerkraut requires a salt brine. You need to use filtered water, without chlorine and non-iodized salt. Both of which kill bacteria. This is an easy one! Rinse with water and wipe dry. Do not put your cabbage crusher in the dish washer. Do not use soap or cleaning agents. 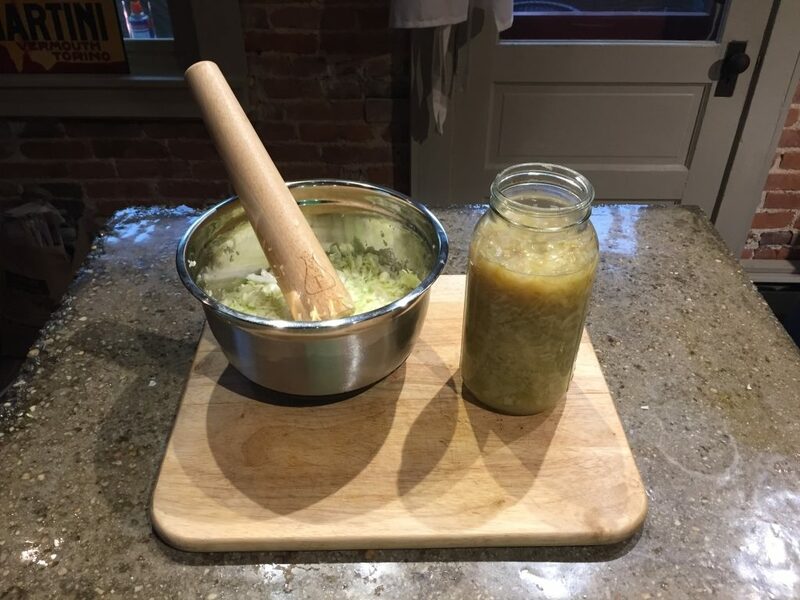 Using some sauerkraut from a previous batch will help kick start the fermentation process. By all means, check out all the options and make your decision. ← Easy Apple Crisp Recipe… a traditional autumnal dessert!